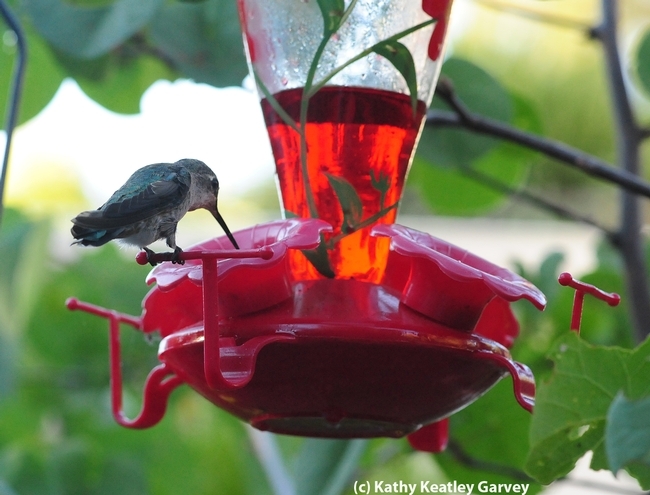 If your hummingbird feeders are filled with that oh-so-tantalizing sweet sugary syrup, you may be attracting not only hummers, but honey bees, too. In fact, the bees may be crowding out the hummers. Just how do you keep your hummers happy and the bees away from the bird feeders? Extension apiculturist Eric Mussen of the UC Davis Department of Entomology is asked that often. The trick, he says, is to make sure the hummers CAN reach the syrup, but the bees CANNOT. "The hummers’ tongues are much longer than bee tongues," he says. "So find or make a feeder that has a little wire screen “hood” over and around the hole where the syrup is available. Eight-mesh is good. If the hummers can’t feed through it, try six-mesh; anything larger than that and the bees can crawl through. Feeders that have the hole pointing upward probably are best. Make sure that the bees cannot reach the syrup anywhere on the feeders--leaks--and your problems are solved." Mussen adds: "If you are not an engineer and don’t wish to build your own, bee-proof hummingbird feeders can be found on the web. Some just use a tube that is too long for the bees to reach the syrup. That is great, unless the device leaks to the sides. Bees are happy to lick up spills. They do not need to reach the main source." Extension apiculturist Eric Mussen of the UC Davis Department of Entomology says: "During the drier parts of the season, in particular, but anytime that it becomes available, honey bees will visit non-floral sources to obtain sugar syrups. Once the bees find such a source, they can recruit other hive mates to join them and soon there are many bees around. Two main sources of such syrup are hummingbird feeders and human foods, especially drinks and melted, previously-frozen treats. "Once the reward is found, it is extremely hard to dissuade the bees from making repeat visits, unless the source is made inaccessible, with nets, screens, etc. Even then, the bees will return, periodically, to see if the source became available, again. "Hummingbird feeders can be manufactured to have feeding outlets that hold the syrup too far away from the hole to allow the bees to reach it. Unless the feeder leaks, or syrup is slopped on the outside, the bees will ignore the feeder. Otherwise, a piece of 8-mesh (eight holes in a linear inch) screen, bent and folded to the proper shape will let the long tongue of the hummer reach through to feed, while not allowing access to the bees. If you use galvanized screen, wash it before using it. "The same person who had the bees at the hummer feeder wished to feed the bees, but elsewhere. 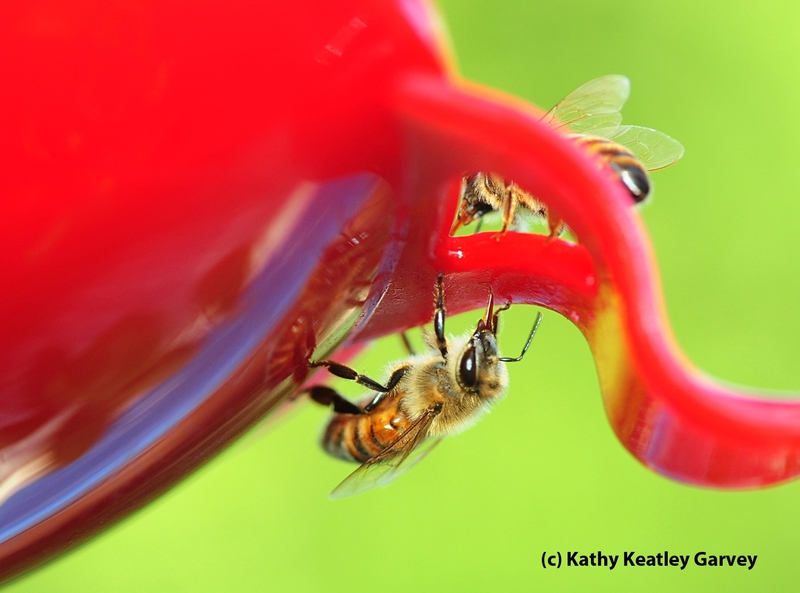 Honey bees will be very happy to dine on sugar syrup formulated as half water/half sugar, by weight. Placed in a feeder with floats or emerging stones, etc. to keep them from drowning, bees should happily visit. But, before starting something like this, consider the following. Honey bees can and will forage up to four miles away from their hive. Using four miles as a radius, that is a fifty square mile area in which to find food. There probably are quite a few colonies within that fifty square miles, and I am not sure that you wish to encourage what could be a huge number of foraging bees to come to your property. If the foragers become overwhelming in numbers and you decide to 'dry up' the feeder, they will continue to make periodic visits to you old feeder location for up to a month after the feeder is removed."